Wolves 40F and 42F, central players in the drama of Yellowstone's wolf restoration, grace the sides of their real footprint. 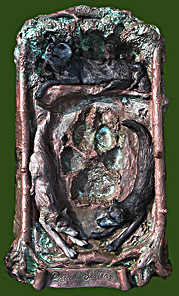 Wolf 42F resides in a den with 5 pups at the top of the artwork. The 3-dimensional relief with footprint measures 17.5 x 9.5 inches and is available by special order. Limited edition of 300 with certificates of authenticity and track story. Track obtained by Dr. Jim Halfpenny - Artwork by C.A. Grende. The footprint featured here, was made May 10, 1998 by one of the heroines, but their close proximity to each other on that day will forever hide the identity of the maker. The footprint measures 7.75 x 4.75 inches. 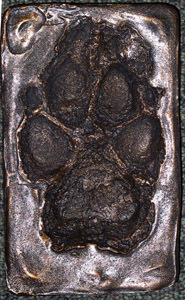 To commemorate the most visible and perhaps the most beloved pack of the Yellowstone wolf restoration project, we present a cold-cast bronze footprint to honor wolf 21M, alpha male of the Druid Peak Pack. 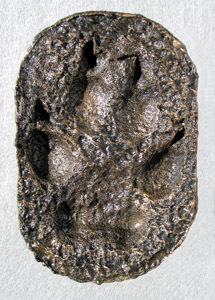 The footprint featured here, was made on June 19, 1999 by wolf 21M and measures 7.75 x 4.75 inches.